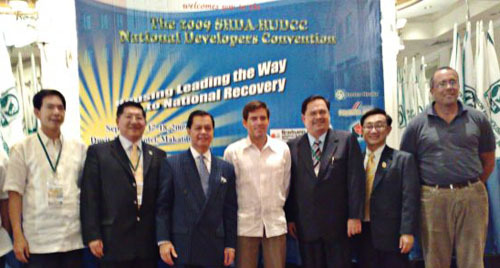 Dr.Sopon Pornchokchai, President, Agency for Real Estate Affairs (AREA) was invited by the Subdivision and Developers Association of the Philippines to present about real estate market situation in Manila. At this occassion, he met with Mr.Noli De Castro, the Vice President, the fourth from left. Dr.Sopon met him once in Davao for the same convention in 2006.